Building the Web of Things: a book by Dominique Guinard and Vlad Trifa on the Web of Things Architecture and our 10 years of experience building Web connected IoT products. 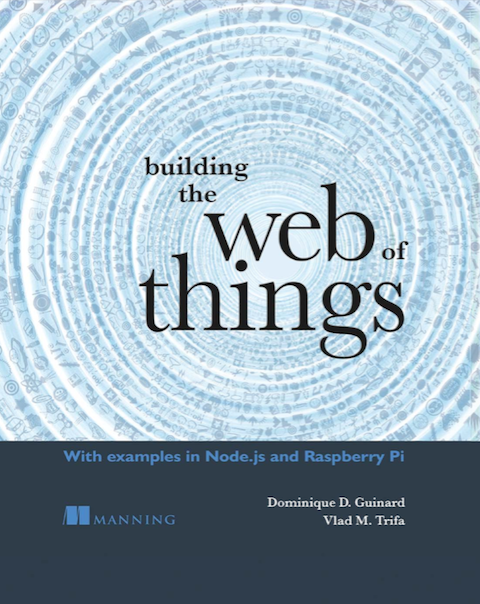 Using the Web to Build the IoT, a free ebook by Dominique Guinard and Vlad Trifa in collaboration with Manning. check the Mendeley Web of Things group gives you links and PDF versions of scientific papers written by the members of the Web of Things community. Feel free to join the group to be able to add your papers! The WoT explained to your children, SVJ. The Internet and the Web of Things, Discover Magazine. The first Web of Things paper is available here: Towards the Web of Things: Web Mashups for Embedded Devices but a good starting point is to read our short Web of Things white paper or our more technical Web of Things founding paper. Web of Things Cook-book: If you want to become familiar with designing and implementing Web of Things systems you should have a look at this book-chapter. Recording of the Web of Things talk @ at Lift 2011. This is a higher level elevator-pitch of the Web of Things. O’Reilly Webinar: Building IoT Systems with Web Standards, a tutorial on how to build Things that integrate with the Web.